The boar is the twelfth symbol in the Japanese Zodiac. Legend has it that the boar outpaced the ox in the race to God, but it ran headlong and shot past God, which was why it ended up in the twelfth place. This sign represents “courage” and “adventure”. Boars are honest, helpful, and have the spirit of pioneer. They put emphasis on fair play, and do not like play tricks. On the negative side, they are short-tempered, and like to see everything in black and white. Are not good at telling lies. Interfere in other people’s business. Affectionate and kind to their loved ones. Boars are compatible with rabbits and sheep. If these three come together, it generates a great positive power. Boars also have a mutually beneficial relationship with tigers. Snakes are the least compatible with boars. 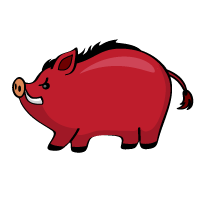 In Japanese, a boar is “inoshishi” in romaji, and is written as “猪” in kanji. In the Japanese Zodiac, however, it is often called “ii” and is written as 亥”.